People could write ‘Abby,’ as she was called, and ask her questions about relationships, parenting, love etc. The weekly questions always started with ‘Dear Abby.’ The responses to the questions could be found in the following week’s paper. Dear Abby ran for years and millions of people loved it. 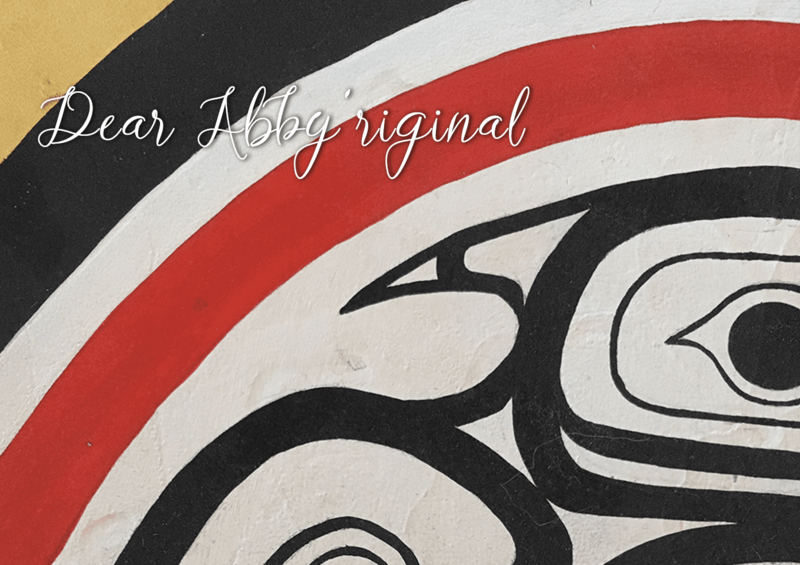 This column, titled “Dear Abby ‘Riginal” is a little different in that writer Kathryn McCooeye will be addressing questions that pertain to Indigenous issues, which affect all Canadians. Her intention is to offer the public a bit of education around some of these complex issues. Kathryn McCooeye is expressing her own personal but informed opinion on these matters. What does the Unist’to’ten gas pipeline blockade have to do me and why should I care? The Unist’ot’en Camp is located on unceded Traditional Wetsu'we'ten territory. Unceded, according to the Supreme Court of Canada, means that the land has never been surrendered nor has there been any due legal process by which the land has been obtained. It has not been bought, traded for or given. In 1997 in the case of Delgamookx versus British Columbia, it was determined by the Supreme Court of Canada that First Nations’ oral history pertaining to territorial boundaries and land occupancy and usage, was admissible evidence in court and that the Hereditary Chiefs of a nation represented the Rightful and Legal leadership of sovereign nations. Further to that, providing that a nation can prove that they occupied their territories before the point of European contact, that the Legal Title to the land is theirs. Gitksan/ Wet’suwet’en have not been able to bring the evidence of proof of occupancy back to court due to the incredible cost to their nations. The previous court case was ten years long and cost the Gitksan/Wet’suwet’en people millions of dollars out of their own personal pockets. Indian Affairs with their colonial Indian Act was certainly not about to foot the bill for a process of justice for Indian people! The Wetsu'wet'en currently intend to initiate the process of bringing the evidence to court and prove that they hold the Legal Title to their territories. Hereditary chiefs are responsible for upholding and enforcing our Traditional Sacred Laws, particularly as they pertain to Sustainable Earth Stewardship and the management of Natural Resources. When the Wetsu'wet'en submit evidence to prove Legal Title for their lands, as per Canadian law, it will be proven once and for all and they will have the legal basis by which to stop multi-billion-dollar industrial corporations coming in and destroying our Canada! The court case will set precedence over all Land Claims court cases and Treaties across Canada. Think of it, under our First Nations laws, decisions would be based on ensuring that the Earth is able to sustain life for the next seven generations. So, for those readers who want to protect the environment, who want to immediately and effectively help address the climate crisis and/or who want to meet the Truth and Reconciliation Commission’s Calls to Action, in my opinion one of the biggest and most important action we can take right now is to support the Wetsu'wet'en in their court case and help finance their legal fund. They are protecting the land for all Canadians and for All Life. Canadians let’s recreate a country that is ours, free from the tyranny of life destroying corporations. We can do this.